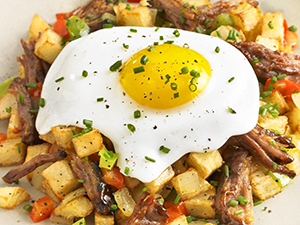 Chefs are turning hash into an on-trend brunch entree with the addition of meats like braised short ribs and carnitas. Here, chef Tunks seasons short ribs with a housemade rub and barbecue sauce, then cooks them over wood chips for a smoky flavor, giving the hash a culinary spin without taking it out of the comfort-food zone. Leftover braised beef, pork, turkey or lamb can also be used in the recipe. 1. Prepare barbecue rub: In large bowl, toss together ingredients, being careful to break up large pieces of brown sugar. Store in airtight container for up to three months. 2. Prepare barbecue sauce: In large saucepan, heat oil. Add onions and peppers; saute until translucent. Add garlic; cook until lightly browned. 3. Stir in brown sugar, ketchup, molasses, vinegar and chipotles; cover and simmer 30 minutes. Season with salt and pepper to taste. 4. Prepare braised short ribs: Trim short ribs of excess exterior fat; coat ribs liberally with barbecue rub. Prepare a cold smoker with applewood chips. Place short ribs in smoker and let meat absorb smoke for 2 hours. 5. Remove short ribs and immediately sear over very high heat just until evenly browned on all sides. 6. Preheat oven to 300 F. Place seared short ribs in deep-rimmed braising pan; fill halfway with barbecue sauce. Cover with plastic wrap and then foil to form a tight seal. Roast in oven for 4½ hours or until meat falls off the bone. 7. Remove from oven and immediately shred short rib meat from bones. Place in large bowl; fold in enough of the cooking liquid to moisten meat. 8. Prepare hash: In deep saucepan, heat vegetable oil to 350 F. Fry potatoes 12 minutes or until golden brown. 9. Meanwhile, in large skillet, heat 1 tablespoon oil. Add onions and bell pepper; saute until translucent. Remove from heat and stir in potatoes, 1 pound short rib meat and barbecue rub and salt to taste. 10. To serve, place mixture into a mold and turn onto plates. Top each mold with two eggs.